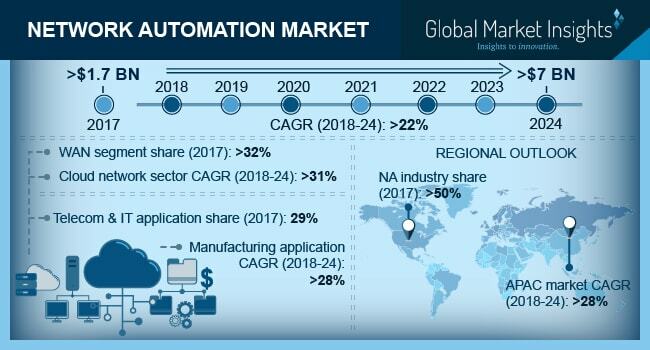 Network Automation Market size is set to exceed USD 7 billion by 2024; according to a new research report by Global Market Insights, Inc. The network automation market growth is attributed to the growing adoption of network function virtualization (NFV) and software-defined networking to modernize the IT environment of the enterprises. The NFV technology enables the service providers to consolidate the several network equipment into a single physical hardware. Furthermore, supportive government initiatives for the commercialization of 5G network technology to reduce the OPEX and CAPEX also foster the market growth. In addition, the flexibility and scalability offered by the technology also augment the demand for the market. The service segment in network automation market is projected to register a CAGR of more than 30% due to a rise in outsourcing activities of networking companies. Traditional IT service providers, technology specialist vendors, automation product vendors and enterprise product vendors are some of the third-party IT service providers offering networking solutions to their end users. The outsourcing of back-end functions to third-party IT service providers boost their operational efficiency and reduce the deployment costs by around 40%. Furthermore, the deployment of third-party vendors enables the businesses to cut down their operational cost by around 60%. Automation Anywhere, TCS, Wipro, and Salesforce.com are some of the key vendors that offer highly secure and scalable data to enterprises. The SD-WAN held a market share of more than 67% in the network automation market in 2017. The automated provisioning principle of SD-WAN technology helps the enterprise to send data packets to its branches without having to configure any changes. Moreover, the cost-effectiveness of the SD-WAN will also foster the market growth. The technology has the potential to reduce the deployment cost by approximately 40%. CloudGenix, Aryaka Networks, and Citrix are some of the leading key players that offer the technology to their users. In July 2018, Citrix partnered with Microsoft Azure to offer consistent productivity and enhanced user experience to their end users. The virtual network infrastructure segment is expected to register a CAGR of more than 29% over the forecast timeline. Virtual networks allow businesses to communicate within the same network without any ambiguity. For instance, Hackensack University Medical Center adopted Citrix Systems’ virtual computing mechanism to assist its patients online. Moreover, the implementation of virtual networks into existing networks also assists organizations to address the networking issues by eliminating unused IPs and network interfaces. The BFSI sector held a market share of over 18% in 2017. The growth of the market is credited to the increasing digitalization among financial institutions. The digitalization of the banking sector will assist the banks to automate their front and back office operations. The adoption of automation in the banking industry will assist the vendors to automate their IT Operations. increasing the productivity and efficiency of the business IT operations by around 60%. The Asia Pacific network automation market is expected to record a CAGR of more than 28% over the forecast period. The surge of investments in the 5G technology will propel the market growth of automation vendors in this region. For instance, Japan’s leading telecom providers invested around USD 45.5 billion to boost the 5G infrastructure in their country. Furthermore, macroeconomic factors such as urbanization and an upsurge in disposable income of end users will have a strong impact on the market growth. The key players operating in the network automation market are Cisco, Juniper Networks, IBM, Micro Focus International, NetBrain, SolarWinds Worldwide, Riverbed, BMC, Apstra, BlueCat, Entuity, Veriflow, 6Connect, Anuta, Puppet, Gluware, Help Systems, Wavestone, IpSoft, Fujitsu, Redhat, Intraway, Arista, Network to Code, Infloblox, Cumulus, Onapsis Efficient IP, Itential, and HCL.